Some years ago, whilst exploring the city of Peshawar in the Himalaya, Professor Geroulanos found three coins portraying ancient Greek Kings, whom Cavafy had addressed in his poem “Coins”. He realized that the poet must have seen many of his poetic heroes depicted on coins and so he decided to research them. The result is this book, which features 140 persons and gods portrayed on ancient coins. A short historical text accompanies each poem. For the first time Cavafy’s historical poems were put in chronological order, irrespectively if they belong to his canon, to the unedited, the outlawed, or the unfinished. Only in this way can the reader understand what the poet was planning. Opposite to the poem, a short historical essay tries to bring the reader into the historical facts of the period that the poem refers to, a short biography of the persons mentioned in the poem is included. Without these comments, the dialog through the centuries, which characterizes the whole work of Cavafy, is not possible. 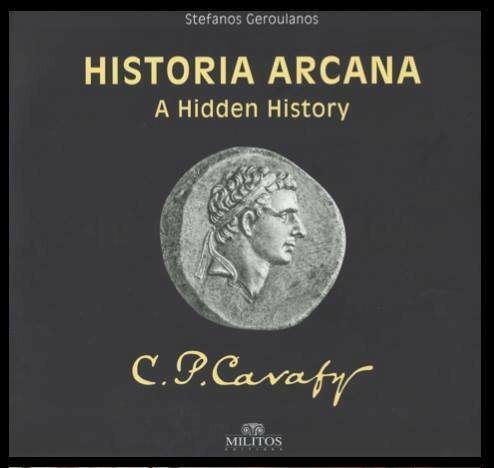 In this book one becomes aware of Cavafy’s deep historical knowledge. However, the poet does not dwell on the major events of History, but rather illuminates small cracks between significant historical landmarks. In front of us parades the whole History of the Hellenic Nation, moments of failure, as well as the weaknesses of major leaders. He describes the big struggles between the leaders, and also the silent passage of the humble persons. One has the feeling that Cavafy has given them a voice. Silence becomes deafening. In this history we will not find the victories but the hidden defeats. We will not find the glorious moments but the wounds. It is an anti-history, a Hidden History, like Procopius would have said. An anti-history with antiheroes, which begins in early antiquity and continues up to the Fall of Constantinople; a history in verses. However, 140 out of approximately 153 persons mentioned are depicted on coins! A history that Cavafy was working on throughout his life and unfortunately stayed unfinished. Now it is too late, he said, a few years before his death.